Welcome to Greatwood Murphy Beds. We offer custom murphy beds at manufacture direct prices. Greatwood Murphy Beds are built by master craftsmen using high quality hardwoods, furniture grade plywoods and custom finishes to meet your décor specifications. The patented Create-a-BedTM lifting and locking piston mechanism is used when building your new generation, state-of-the-art murphy bed. The space saving capability of the murphy bed is a huge benefit. Whether you have a spare room, workout room, office or child's room, the Murphy bed provides a comfortable night sleep, utilizing any variety of innerspring mattresses. 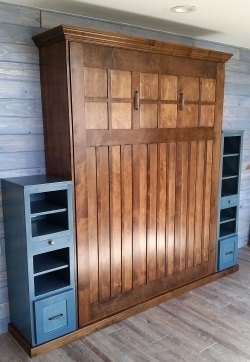 When not in use, the Murphy bed can be closed up, your bedding in place, becoming a beautiful piece of furniture. A custom Murphy bed can provide a lifetime of use. Custom finishing ideas are limited only by your imagination.